A bill rewarding sea otter hunters was praised and panned at its first hearing on Wednesday. The measure proposes paying $100 per otter. Only Alaska Natives can legally harvest the protected marine mammals. And federal rules limit processing and sales. The sponsor is Bert Stedman, a Sitka Republican whose district includes Southeast’s outer coast. 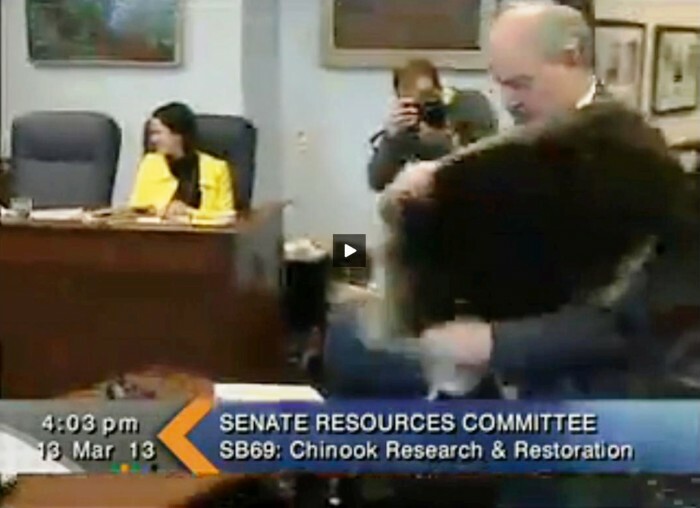 He wore an otter pelt on his shoulders as he came before the Senate Resources Committee, saying a bounty would slow rapid population growth. Bert Stedman carries a sea otter pelt before explaining his bill to the Senate Resources Committee on Wednesday. Craig Mayor Dennis Watson, a former commercial diver, says he’s watched as otters moved in — and his catch disappeared. “For 16 years I stared into a viewer as my partner and myself drug an underwater camera along the bottom of the ocean surveying for sea cucumbers. Through that, I have witnessed first-hand the devastation these creates cause while their numbers grew,” he says. Scientists estimate the Southeast otter population at around 21,000. Research shows 12 percent annual growth in the southern part of the region, and 4 percent in the north. Other coastal areas, such as Kachemak Bay near Homer, have also seen large increases. Joe Sebastian, a commercial fisherman from Kupreanof, near Petersburg, says overharvesting is likely the cause of shellfish declines. He says the bill wrongly blames otters. “I find it unprofessional, unscientific, racist and culturally destructive. This particular bill, in its present form, is not the way to go and would start the new sea otter gold rush with little or no oversight or scientific direction,” he says. Bill sponsor Stedman admits the measure conflicts with federal marine mammal protection rules. He says if a bounty isn’t legal, the state could subsidize tanneries to help build the otter-products industry. He stressed that the bill would not exterminate otters. He says about 850 were killed last year and an increase to about 2,100 would not significantly damage the population. Former commercial diver Julie Decker of Wrangell agrees. “Otters are a renewable resource. They can contribute to the economy of Southeast. However, if they are protected and the population allowed to grow at the rate it is growing now, they will destroy all the shellfish resources,” he says. The committee delayed further testimony until Friday afternoon.